Today I noticed several ETFs I own, including SLYG, opened at a significantly lower value than they closed at yesterday (SLYG was $7.975 lower to be exact). Apparently yesterday a dividend was declared and today was the ex-dividend date. I am familiar with the concept of dividends and I understand that a stock's value should drop by the amount being distributed as a dividend. However, that does not seem to fully explain this morning's drop. TD Ameritrade reports that today was the ex date for an $8.13 "capital gains, short-term", a $0.306 "capital gains, long-term", and a $0.873 dividend which sums to $9.309. My understand was "capital gains" refers to the gain in value of an investment asset upon sale of said asset, but I did not sell my shares. 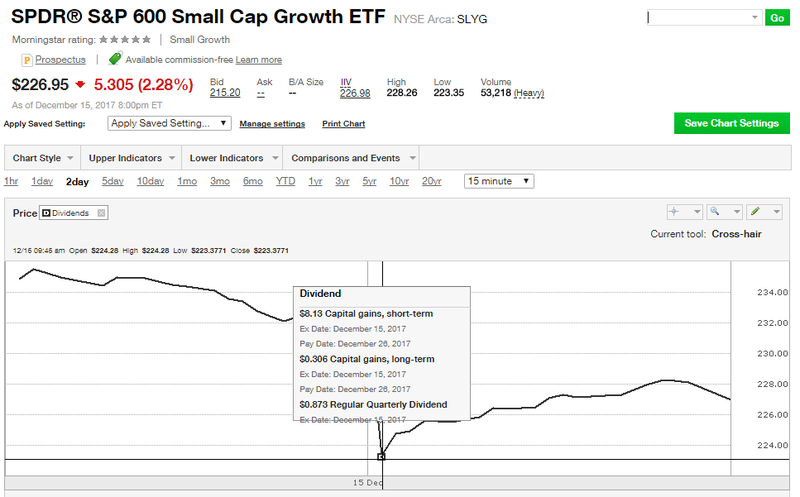 It seems the market is treating these "capital gains" as if they are dividends, but I am not totally sure though because the price drop was not exactly equal to the gains or the gains + dividends. How are these capital gains different from dividends? Will I be receiving them as a cash distribution at the same time as my dividends? Are they taxed at a different rate? If they are effectively the same, why make the distinction in the first place? Although an ETF trades like a stock, it is really a stock mutual fund. And like all mutual funds, when you invest there are two ways that you realize a capital gain. As you mentioned, you have a capital gain when you sell a stock for more than you purchase it for, so when you finally sell this ETF, you will have a capital gain if the value of the ETF has gone up from when you bought it. However, the mutual fund is also a collection of stocks, and the fund managers buy and sell stocks inside the fund. When they sell a stock that has increased in value, they realize a capital gain. This money that they gain is then distributed to the fund owners in a similar way to dividends. It is referred to as a capital gain distribution. You'll most likely receive this capital gain distribution along with your dividend. In the U.S., at tax time, the capital gain distribution will be called out on your 1099-DIV form. The short-term distributions will be included with the dividends on the form, and you will pay ordinary income tax on those. The long-term gains, however, will be subject to the lower capital gains tax rate. See the Schedule D instructions for more details. Your mutual fund manager buys and sells securities in pursuit of the investment strategies of the fund as well as to invest new money coming in and to pay out investors wanting to take their money elsewhere. This results in capital gains and losses for the fund. The net capital gain is taxable income (at corporate rates) to the fund unless the fund distributes the gains to the shareholders in which case the investors have to pay the taxes on the gains that they receive. That would be capital gains tax (short and long term, according to what they say is the amount of each). Not the answer you're looking for? Browse other questions tagged etf dividends capital-gains-tax capital-gain ex-dividend-date or ask your own question. Are there capital gains taxes or dividend taxes if I invest in the U.S. stock market from outside of the country? What should I use as the cost basis for stock that was purchased before becoming a US resident? What would a stock be worth if dividends did not exist? Why would a mutual fund plummet on the same day it pays its annual distribution & capital gains? Why are capital gains taxed at a lower rate than normal income? Are stock buybacks similar to dividends?